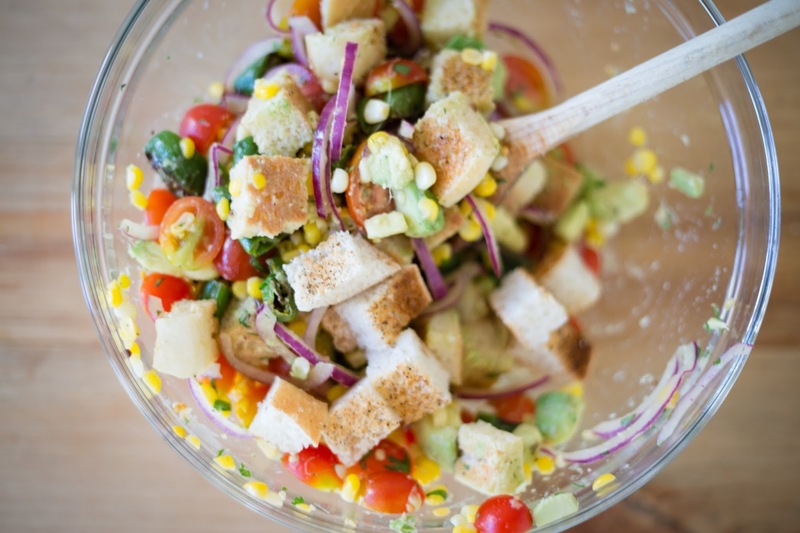 I swear when I made this salad last week it was still summer. It was 85 degrees and I was still running the AC. And then suddenly overnight it switched to fall. It's ok though, all these veggies will still be in season for at least another week or two (or more if you live in Cali), so this can be your farewell to summer celebration of corn and tomatoes and padron peppers. I made this out of a hodgepodge from recent Blue Apron shipments and random stuff I had on hand. I love doing that. It makes me feel like I'm on an episode of Chopped. Except without the high pressure. And TV cameras. And discerning judges. And wacky ingredients. (OK, it's not really like Chopped at all, but it's still fun). Speaking of Blue Apron, I'm a fan. I didn't know how I would feel about it being that I enjoy coming up with my own recipes. But let's face it. Sometimes you just want someone to make decisions for you. I've been really impressed with the variety and the quality of the ingredients and recipes. And even if I don't end up making all 3 meals exactly as they designed, at the very least it's as if someone just did your grocery shopping for you. For example, this salad. I also sorta got the idea for this from Blue Apron. 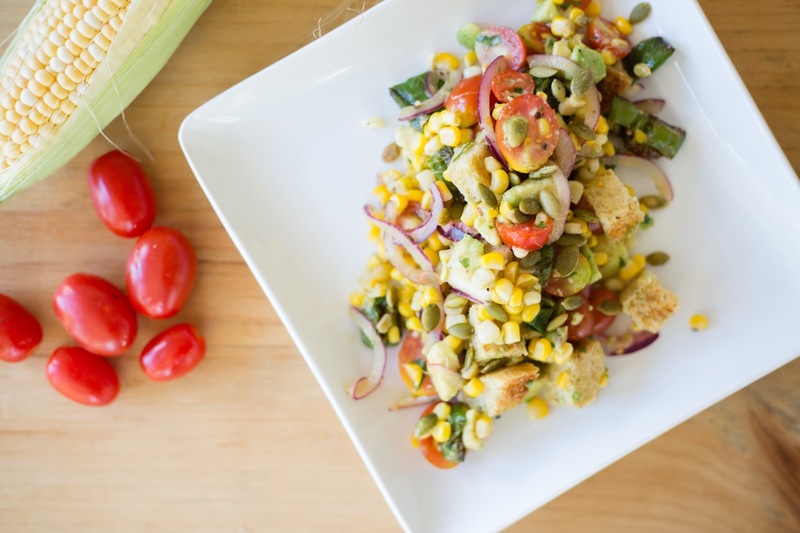 They did a more traditional Italian Panzanella salad a few weeks back but I decided to make a Mexican inspired version. And as an extra bonus I had frozen some Torta rolls from a previous recipe I freestyled on, so that served as my bread aspect. Brush with some oil, and sprinkle with salt, pepper, chile powder and cumin. 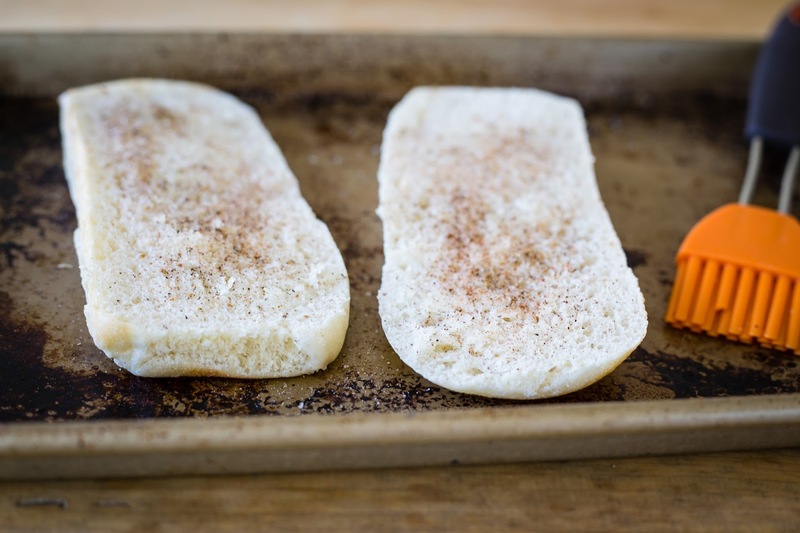 Toast under the broiler until browned, cool and cut into cubes. (And try really hard not to forget about them and burn them. I ALWAYS manage to burn the bread). 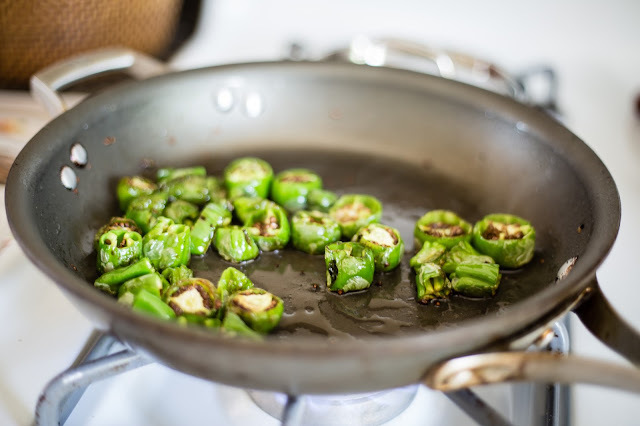 Meanwhile, sauté the padrons in oil until they blister. Then the corn for a minute or two. Allow both to cool in a bowl, along with the oil used to cook the vegetables. Season with salt and pepper to taste. 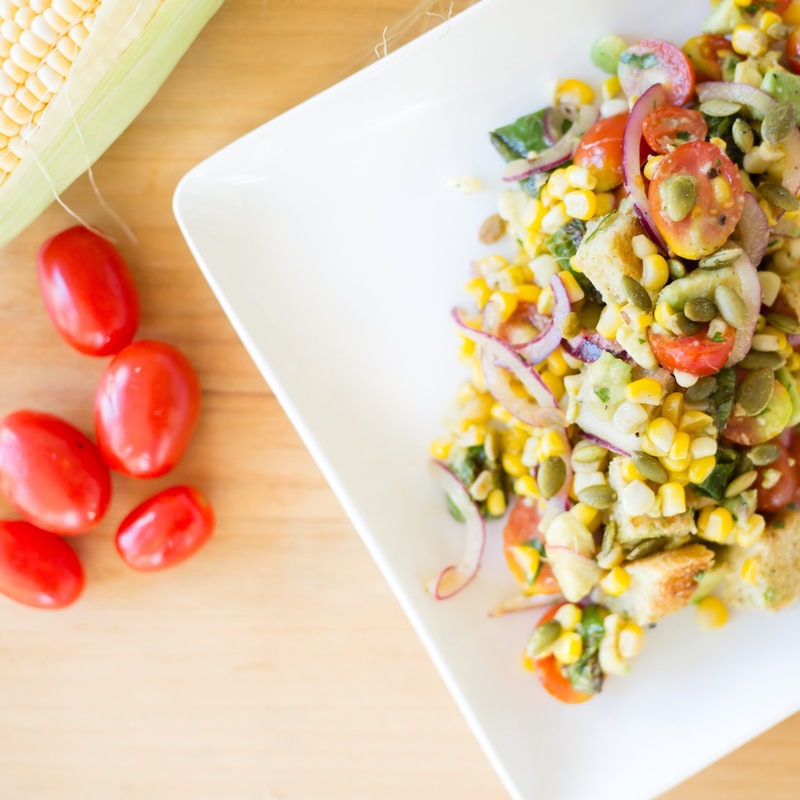 Once veggies have cooled, add halved cherry or grape tomatoes, diced avocado, onion, cilantro and juice from one lime. Gently toss to combine. About ten minutes before serving, fold in the croutons and pepitas. Taste and add more salt and pepper if needed. This would be great alongside spicy blackened fish or chicken! Peace out summer, you're always gone too fast. Prep all of the vegetables. Remove kernels from cob. Remove stems from peppers and cut each one into equal pieces (usually cut each one into thirds). Halve tomatoes, dice avocado, mince cilantro. Cut torta or ciabatta roll in half lengthwise. Brush each side with a little oil. Season with salt and pepper, and sprinkle with a little bit of chile powder and cumin. Broil until lightly toasted and cool. I worked on chopped! Was an awesome production to be a part of. 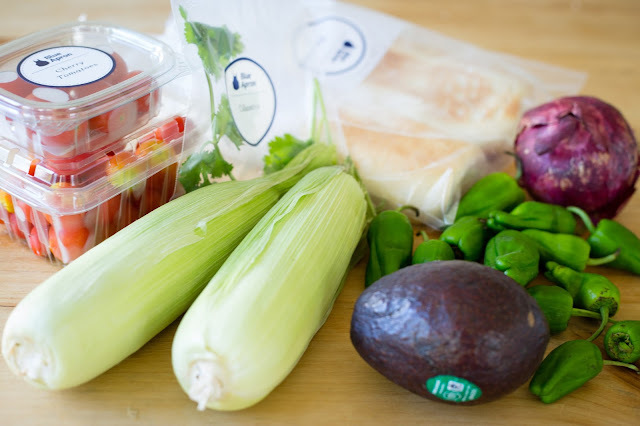 Blue apron is an interesting concept, gonna have to check it out. As for the panzanella, it looks amazing. Nice touch with the Torta bread. Thanks Zack!! Hope you enjoy it.